Dynaudio Confidence Platinum to debut at Bristol Show 2014 | What Hi-Fi? Scandinavian speaker brand Dynaudio will be bringing the new Confidence Platinum series of loudspeakers to the Bristol Sound & Vision Show later this month. While the technology within the speakers remains the same, the series has received a costmetic overhaul in line with the striking aesthetic found on the flagship Evidence Platinum speaker. 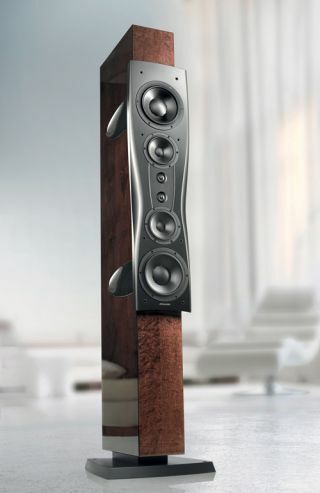 The Confidence series feature Dynaudio's own DDC - Dynaudio Directivity Control - technology in the C2 and C4 floorstanders. This aims to address your room acoustics without altering the music signal via room correction electronics. All Confidence speakers are fitted with Dynaudio's own Esotar2 tweeter: a 28mm fabric soft tweeter that has been further improved with Dynaudio's Precision Coating. Dynaudio will also be demoing the Excite series of speaker at the Bristol Show. Dynaudio can be found at Stand Foyer 2a at the show, which takes place from Friday 21st to Sunday 23rd February.